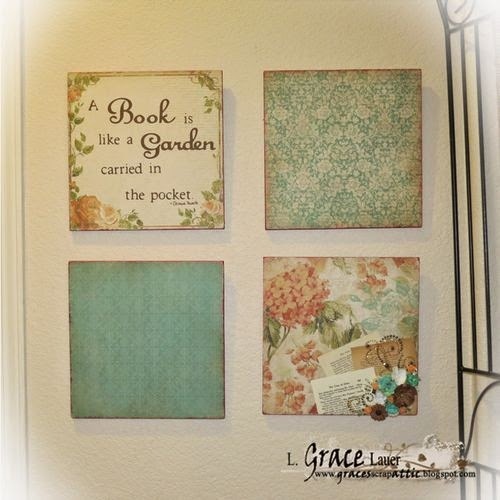 Uniquely Grace: Turn Your Favorite Scrapbook Paper Into Wall Art in 4 Simple steps! Turn Your Favorite Scrapbook Paper Into Wall Art in 4 Simple steps! Welcome back for an extremely easy project that is sure to spruce up any room. It can be made as simple as you want or you may embellish it with stunning flowers, gems and trinkets. 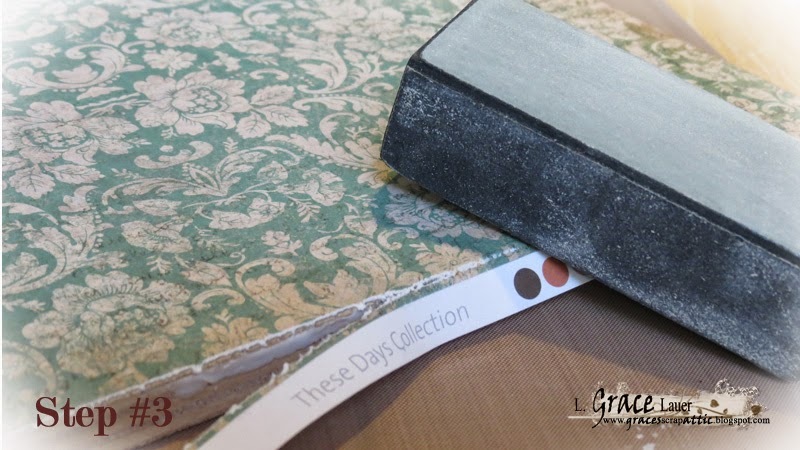 Turn your favorite scrapbook paper (you know the stuff... it's been in your stash for so long because you won't dare cut into it or cover it up with photos because it is so pretty) into decorative wall art panels. Spread your Helmar Acid Free Glue over 1/2 of your board (I bought a board at the big box hardware store and they even cut it for me into 12 x 12 blocks for free) or you can purchase them at a local hobby and craft stores pre-cut. This is raw wood so the glue will absorb faster to into the surface, I used a bit more then I would usually. 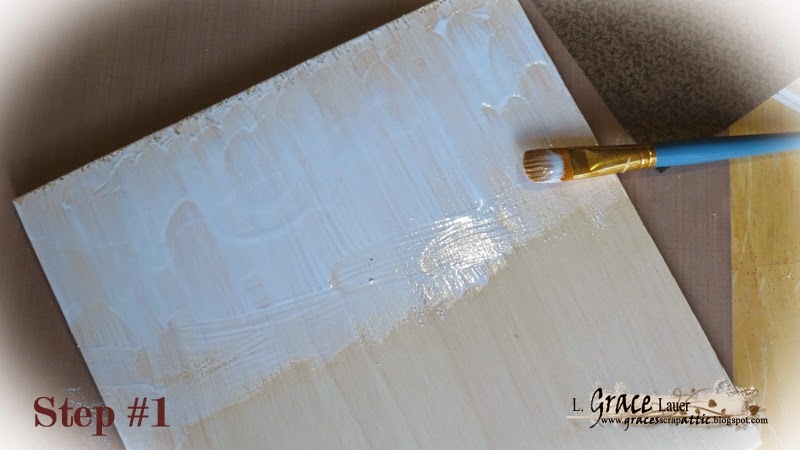 You can gesso the wood prior to this step and use less glue and save a painting step later on. 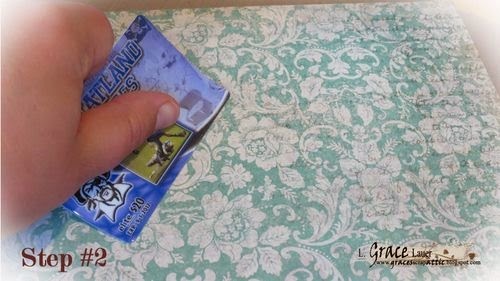 Place your beautiful scrapbook page over the top of the Acid Free Glue while it is wet and use a Helmar Glue Spreader/Old Credit Card/School ID to smooth out all bubbles and creases. I prefer for this step a flimsy credit card type card so that there is a softer touch to the paper minimizing the chance of snagging (Paper vs. Cardstock). Begin smoothing out in the center of the paper and then to the edges. *Repeat step #1 for the second half of the board and then repeat step #2 to finish adhering the scrapbook paper to the board. With a sanding block, distress/remove any excess parts of paper from around the edges. Round the corners with this tool as well. Clean up any excess Acid Free Glue that may have seeped out in Step #2 and paint the sides of the boards (if you did not gesso them prior to step #1). 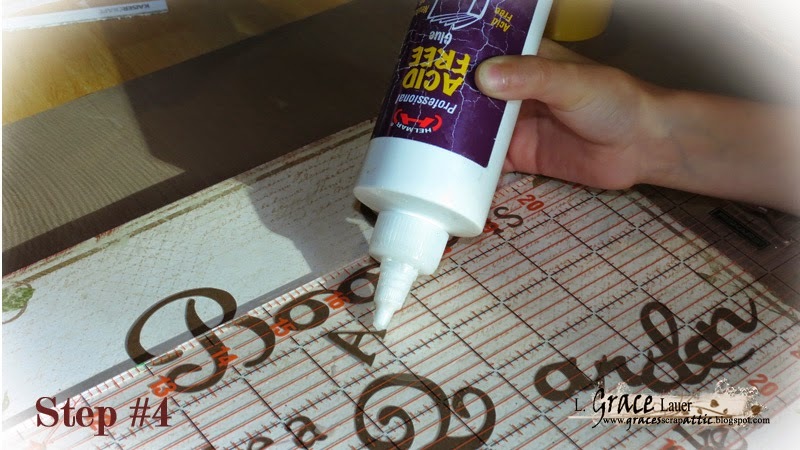 Use your glue to adhere your lettering prior to any embellishments. I used a tiny paint brush to apply the glue to the back of the letters so there would not be much excess. I lined it up with my quilting ruler to help keep a strait line with the board. 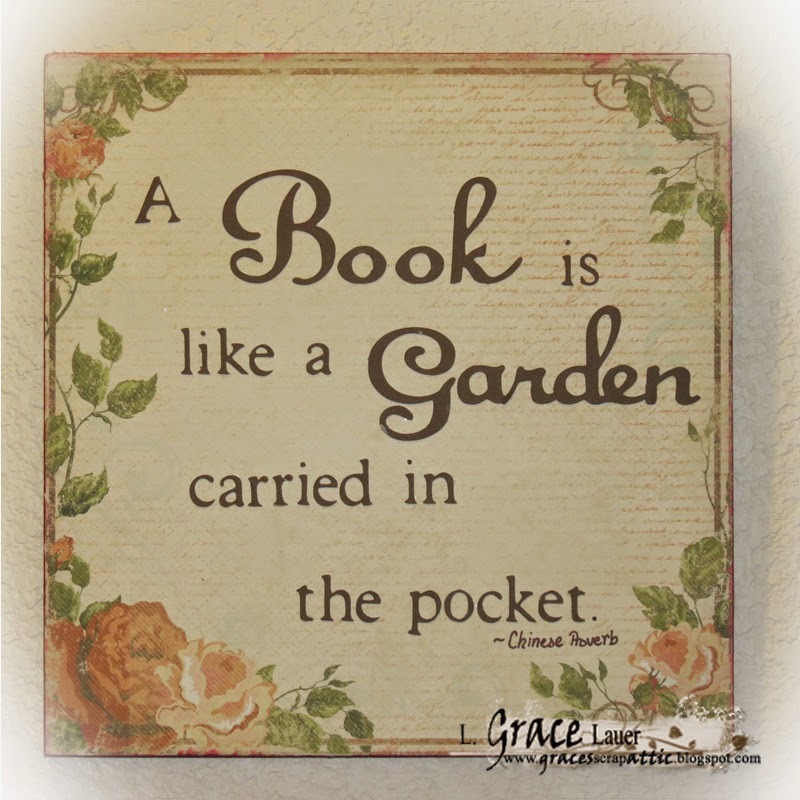 The praise I chose to add was the Chinese Proverb: A Book is like a Garden carried in the pocket. Embellish with your style! 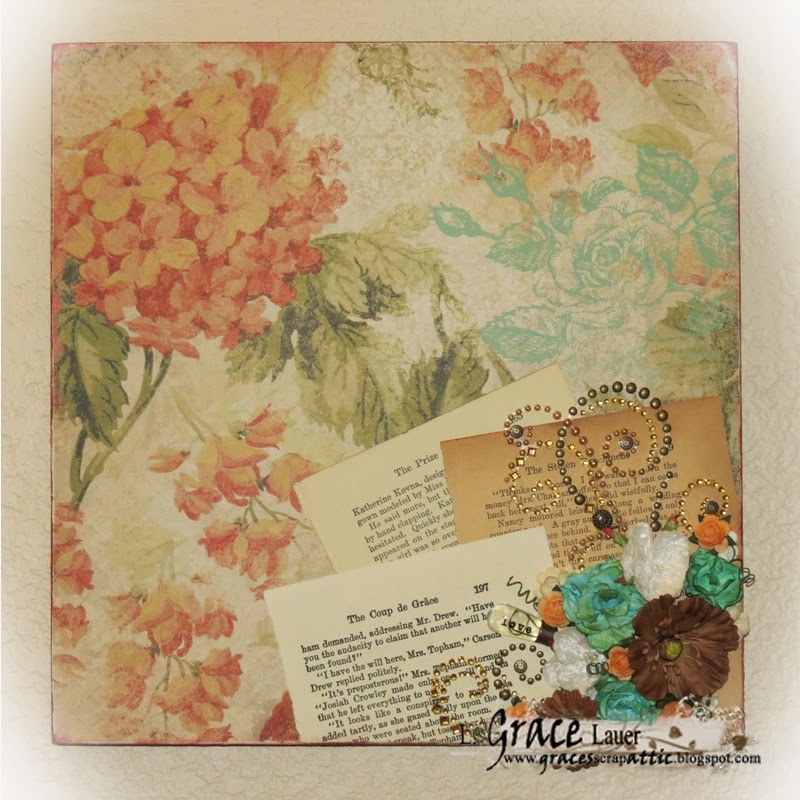 I added these book pages using steps #1 - #3 and more flowers, bing, gemstones and trinkets too. Have fun with this! Install the picture hanging hardware on the back side of our panels. Make sure to have the right side up. I hope you enjoyed this project. It is one of my favorites and oh so easy to create something for a powder room, livingroom, kitchen and can be done in almost any scrapbook paper size, 6" x 6", 8" x 8", 12" x 12". These could also make great gifts for Mother's day, Teacher appreciation, birthdays etc.